While previously primarily having been recognized as deadly threats, in recent decades bacteria have emerged as being crucial to our survival and even integral parts of the human organism. In parallel, however, there are growing concerns over bacteria’s ability to develop resistance against antibiotics. Thus, the contemporary position of bacteria is ambiguous. 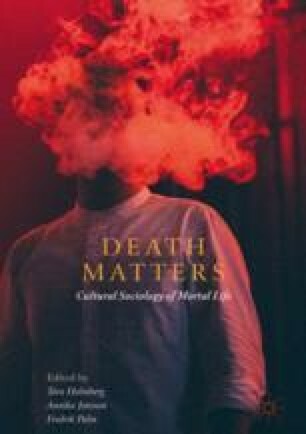 Using accounts from the news media and science, this chapter explores how bacteria can contribute to a cultural sociological discussion on death. This chapter suggests that bacteria have the potential to both unsettle and settle life and death as certain states and as each other’s opposites. It argues that bacteria can be conceptualized as paradoxical figures, enabling both opposing and symbiotic understandings of life and death—as excluding and feeding each other. Costandi, M. (2015, May) ‘Life After Death: The Science of Human Decomposition’, The Guardian, https://www.theguardian.com/science/neurophilosophy-/2015/may/05/life-after-death, accessed 10 May 2018. Gallagher, J. (2018, April 10) ‘More than Half Your Body Is Not Human’, BBC News, http://www.bbc.com/news/health-43674270, accessed 15 June 2018. Gustafsson, P. (2016, November 1) ‘Bakterier Formar Vår Hjärna’, Sveriges Radio, http://sverigesradio.se/sida/avsnitt/800453?programid=412, accessed 10 May 2018. Lindblad, T. (2016a, November 29) ‘Brist på Bakterier Kan Göra Oss Sjuka’, Sveriges Radio, http://sverigesradio.se/sida/avsnitt/813364?programid=412, accessed 10 May 2018. Lindblad, T. (2016b, September 19) ‘Bakterierna Styr Svåra Liv’, Sveriges Radio, http://sverigesradio.se/sida/avsnitt/780424?programid=412, accessed 10 May 2018. Mossop, B. (2014, July 10) ‘From Ancient DNA to Decay: An Interview with Jessica Metcalf’, eLife, https://elifesciences.org/interviews/ff613808/jessica-metcalf, accessed 10 May 2018. The Scientist. (2014, August 1) ‘The Body’s Eco-System’, The Scientist, https://www.the-scientist.com/features/the-bodys-ecosystem-37085, accessed 10 May 2018.